Rutgers in the First World War, May and June 1918—A World in Motion – What Exit? When the United States entered World War I a century ago, Rutgers transformed into a war college focused on supporting America’s war effort. Many students and alumni joined the armed forces. Earl Reed Silvers, assistant to Rutgers president William H. S. Demarest, launched the Rutgers War Service Bureau as a means to keep in touch with Rutgers men in service. The Rutgers in the First World War series features stories from the War Service Bureau correspondence, offering a window on the impact of the war on Rutgers students and alumni 100 years ago. The May 1918 War Service Bureau letters to men in service brought news of baseball and commencement activities at Rutgers. On May 20, Silvers wrote about a game taking place that afternoon. Rutgers men in service wrote to the Bureau in May and June 1918 to describe their travels overseas. On May 1, 1918, August Grimme (class of 1918) wrote from the north of England. Reverend Maurice Kain’s (class of 1906) May 18, 1918 letter waxed poetic in its description of France (his correspondence folder does indeed contain a poem about France). 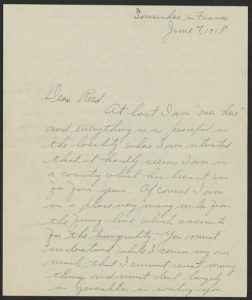 First page of Ainsworth’s June 7, 1918 letter. Transcribed version also available. On June 26, 1918 Stuart M. Firth (class of 1914) described other watery travels on French soil (transcribed version also available). 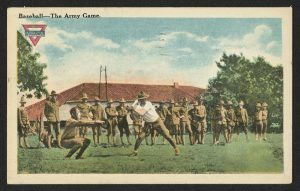 The Rutgers College War Service Bureau collection has been digitized with assistance by a grant from the New Jersey Historical Commission, a division of the Department of State. A finding aid describing collection is available and provides links to the digitized materials. *The commencement program for 1918 lists 46 graduates.